I have always had a nerd streak in me. When I was in grade school, I started a bank. Not a piggie bank, but an actual bank. My aunt Marge was the only one that made a deposit. I collected cans and hangers and turned them in for cash. I started a hotel (more of a restaurant) in the garage attic across the street and sold food to the neighborhood kids out of it. My older brother threw away a slew of automotive stickers that I found in the trash, took to school, then sold them for a tidy profit. With all that in mind, I always had goals for myself. As I got older, goals went on written paper. Being a "pack rat," I save a ton of stuff that doesn't make sense at the time. I have nearly all my airline boarding passes over 20 years of traveling. I'm not sure why I save them or what I will do with them someday. Every once in awhile, I go looking for something in the crawlspace of my house and discover something interesting. 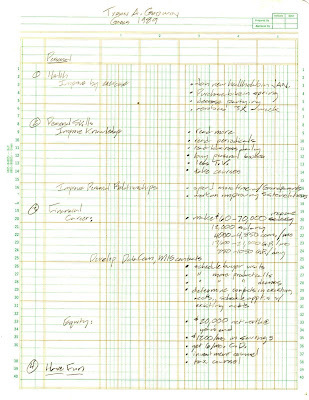 Being a nerd and with goals in mind, I set pencil to paper and laid out some goals in 1989. I came across them and found it interesting enough and too funny not to share. sport. My goal in 1989 was to join a new healthclub in January, purchase a bike in spring, decrease partying (hilarious,) and aerobics 3 x a week (even more hilarious.) That was such an 80's thing, and no, I did not wear leg warmers, leotard, or head band. I do however now own running tights, run hats with head band sweat protection built in, and one "bitchin' race bike." 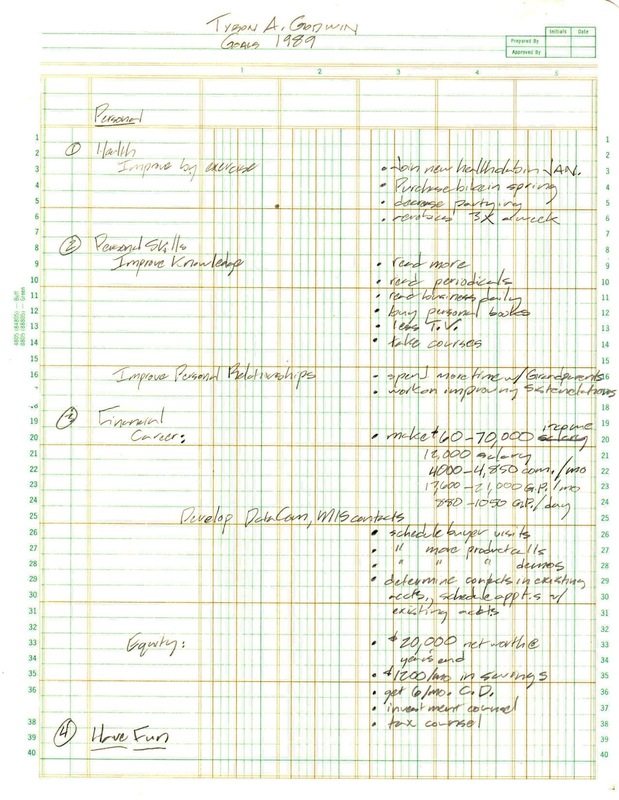 I listed my goals as read more, read periodicals, read business daily, buy personal books, less T.V. and take courses. I'd have to say that I have done slightly better on most of these, but don't read for personal pleasure nearly enough. I should add "write more" to my list 25 years later as I'm doing much more of that with this blog. The other goal I had listed here was spend more time with grandparents and work on improving sister relations. I feel great about the time spent with my grandparents and have many fond memories. They are unfortunately no longer around, but I still reflect on the great times I had with them and share their stories with my kids...including my grandpa's propensity to cuss while playing cards. The sister one baffles me as I have a great relationship with my sister that lives here and my other sister in Seattle. I must have fixed that one effectively because I have no idea why I wrote that one. Perhaps because she had some "hot" friends. Not boring you with work, but ironically two of the details I listed here to achieve those goals was to "schedule more product calls," and "schedule more product demos." I'm still in sales and still doing both. Today I had a call with a business partner and the title of the meeting was, "identifying options for demonstrating...(system.)" The more things change, the more they stay the same. Some things don't change. I love my life and family and still work very hard on this one. The irony in looking over these goals is the reason I started this blog was I had a goal of qualifying and racing the Boston Marathon. I ran my third this last April. I suppose the lesson learned there is if you want it, "put it in writing" and you're more likely to succeed. In fact, as a marathon runner and triathlete I have become somewhat obsessed with goals. I work out seven days a week to achieve those goals. I have a half marathon this weekend and have very specific goals I've set for myself. Perhaps I should write them down and put them in the crawlspace to review in another 25 years.